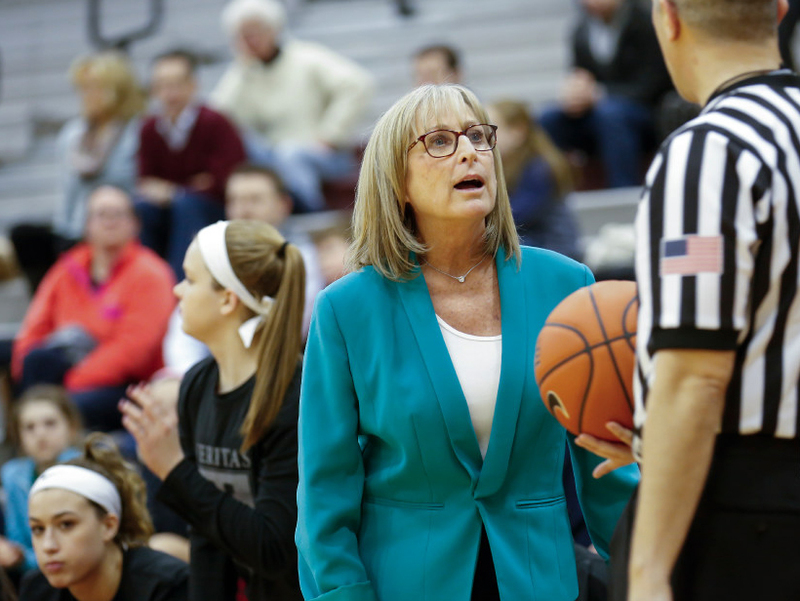 Harvard women’s basketball coach Kathy Delaney-Smith, shown earlier this season, was honored during the team’s alumnae weekend. Late last Saturday evening, Harvard women’s basketball head coach Kathy Delaney-Smith stood in the front of the lounge of Dillon Field House and raised a toast to the dozens of former players gathered for the team’s alumnae weekend. “She is Harvard basketball,” added Harry Collins, a longtime fan, who along with his wife, Linda, started attending Harvard games in 1996 when Allison Feaster ’98—who went on to play professionally for 18 years—and a teammate volunteered to coach Linda’s local rec league basketball team. In fact, the weekend was a microcosm of how the program has thrived. After a snowstorm postponed Friday night’s game against Brown, the weekend’s festivities began with Saturday afternoon’s alumnae game. At first, the contest was laid-back. Sophomore guard Sydney Skinner sang the national anthem, and about 30 former players took the floor at Lavietes Pavilion. It was black versus white, with the players wearing an assortment of old practice jerseys and T-shirts as they prepared to play a full 40 minutes. Several dozen other alumnae watched from the stands, keeping an eye on children (some of whom were rolling basketballs from the top of the bleachers) while reminiscing about bygone accomplishments, including the Crimson’s upset of top-seeded Stanford in the 1998 NCAA tournament. That game remains the only time a 16-seed has knocked off a one-seed in the NCAAs. Alison Seanor ’98, a starter on that squad, remembered that she and her teammates were confident that night: they had the top scorer in the country in Allison Feaster, and they had experience in the tournament, having played competitively against Vanderbilt in 1996 and having faced North Carolina in 1997. Amy Reinhard ’96 remembered how impressive it was to watch the game from the stands. But soon the increasingly competitive game in front of them demanded attention. With just over a minute left, an apparent missed foul call on the black team caused some friction. Then a scrum formed on the baseline with one second remaining. The black team—clinging to a two-point lead—insisted that the ball had gone off the white squad. But the referees—all current Harvard players—awarded possession to the white team and put three seconds on the clock. In what Delaney-Smith later acknowledged may have been some inaccurate timekeeping, those three seconds ended up lasting closer to seven, providing just enough time for two-time Ivy League Player of the Year Hana Peljto ’04 to score a game-tying put-back at the buzzer. Now the players were showing the intensity that had helped them hang 11 Ivy League championship banners from the rafters. Some wanted overtime. Others were questioning the referees. Then Delaney-Smith broke the alumnae into groups for a shooting drill for old times’ sake. Afterward they quickly swapped high tops for snow boots. It was time to hit the showers so that they could get back to Lavietes. The entire program was locking in on the next contest. The most recent graduates sat courtside, creating a powerful cheering section directly across from the Harvard bench. Older alumnae filled the bleachers behind them, anxious to get a look at the current Harvard squad and to see how much had changed from their playing days. There were some subtle rule differences, such as the switch from 20-minute halves to 10-minute quarters. Alumnae also took note of the new talent, especially point guard Katie Benzan ’20, whose court vision is so strong that some wondered whether the career-assists record of Jennifer Monti ’02 might be in jeopardy. But mostly what struck them was how familiar it all was: the team still used some of the same play calls, and as the game stayed close down the stretch, one player felt her palms grow sweaty, as though she were back on the court. And, of course, the reassuring sight of Delaney-Smith, who as Katherine Rollins ’09, said, seems “better than ever” in her thirty-fifth season. The Crimson, with a double-double from senior co-captain Destiny Nunley, held off Brown—which had entered the game tied with Harvard for second place in the league—69-59. After the game, Delaney-Smith lauded her team for defeating the Bears and emphasized the importance of the vocal alumnae contingent. The gathering also served as an opportunity to look toward the future. Of particular interest was the effort, begun last summer, to endow Delaney-Smith’s coaching position. The women’s lacrosse team had done so, and that “lit a fire” under the basketball alumnae, said Amy Reinhard. She is leading the effort with Catherine Crisera ’96, who said they were also moved by the death last year of legendary Tennessee women’s basketball coach Pat Summit and want to honor Delaney-Smith while she is still coaching. Looking around the room, one could see the effect that Delaney-Smith and the program have already had on generations of Harvard alumnae. On one side of the room was Trisha Brown ’87, a member of the coach’s first Ivy League championship team, who is now a head coach herself, at Stonehill College. Leaning against the wall on the other side of the room was Massachusetts attorney general Maura Healey ’92, a former Harvard point guard. And then there was Allison Feaster, the fifth pick in the 1998 WNBA draft and a sports envoy for the U.S. State Department. As the night wore on, and Delaney-Smith continued joshing with former players about the conclusion to the alumnae game, she was already shifting her focus back to a more immediate task. Eventually she declared, “We have a game tomorrow,” signaling that the party would soon be winding down. The Crimson won that one too, thrashing Yale 76-56 on Sunday afternoon and pushing Harvard’s record to 18-3 overall and 6-2 in the Ivy League. Yet another brick in the house that Delaney-Smith has built. Tidbits: At halftime of Saturday’s game, former Harvard player Pat Magnarelli ’10 proposed to former women’s team member Brogan Berry ’12 at center court. Delaney-Smith allowed her current team to watch the proposal (Berry said yes) and then immediately pointed them toward the locker room. The Harvard men’s team defeated Brown 87-74 and Yale 75-67 on the road to improve their record to 14-7 overall and 6-2 in the Ivy League. Freshman point guard Bryce Aiken led the way, with 23 points against the Bears and a career-high 27 points against Yale. The Crimson returns to action next weekend at home against Columbia and Cornell.